Lexington, Kentucky – Big Brothers Big Sisters of the Bluegrass (BBBS of the Bluegrass) announced at its annual Volunteer Appreciation Dinner June 19 that the Big Brothers Big Sisters Nationwide Leadership Council will present the local program with the 2017 Big Brothers Big Sisters of America Quality Award. BBBS of the Bluegrass is in its 61st year of serving the Central Kentucky community’s children. 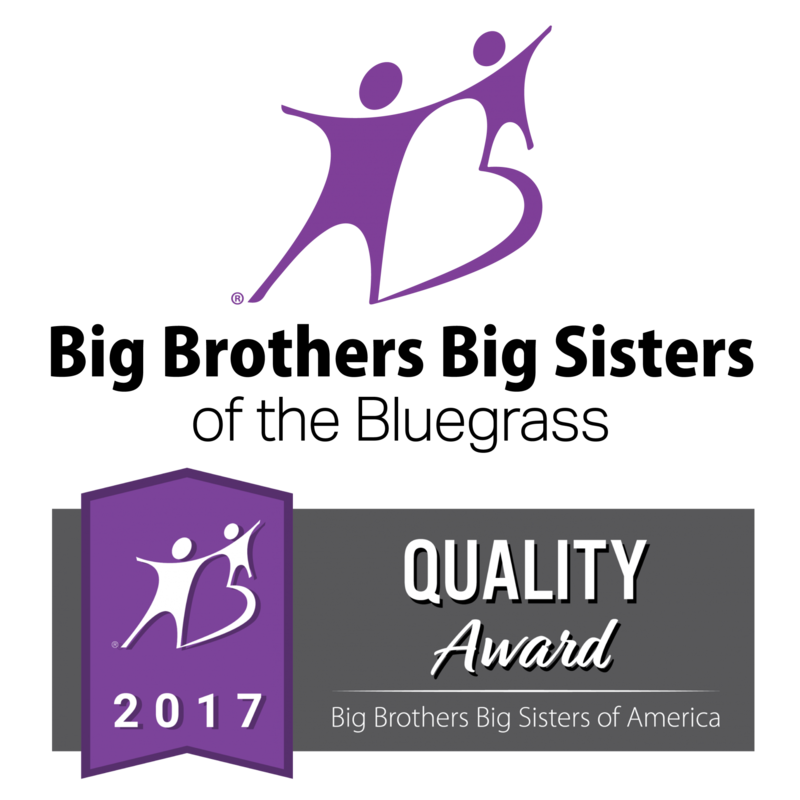 Out of nearly 300 Big Brothers Big Sisters agencies, BBBS of the Bluegrass is one of only 28 that will be recognized as a Quality Award Winner at the 2018 Big Brothers Big Sisters National Conference in St. Louis, Missouri, on June 26. Last year, BBBS of the Bluegrass served 478 children by connecting them with supportive adult volunteers (“Bigs”) and supporting those mentoring relationships. The Quality Award recognizes BBBS of the Bluegrass for its excellent community programming. With an increased focus on quality and improving partnerships with schools, in 2017, BBBS of the Bluegrass expanded its School-Plus Community program from serving one Fayette County Public School to serving three elementary schools and increased the number of High School Bigs in Montgomery and Jessamine Counties. “Each match between a Big and Little requires attention and support, and this Quality Award shows that Big Brothers Big Sisters of the Bluegrass has done an outstanding job matching children and supporting those mentoring relationships,” said Pam Iorio, president and CEO of Big Brothers Big Sisters of America. In 2017, BBBS of the Bluegrass celebrated its 60th Anniversary by launching new initiatives and expanding programs to better serve the community. Launched in 2017, the Bigs in Blue program, which partners the agency with local police departments, kicked off in Lexington and Richmond, and resulted in 10 new matches with police officers serving as Big Brothers and Big Sisters. At this year’s Volunteer Appreciation Dinner, BBBS of the Bluegrass awarded the Lexington Police Department with the Silvey Award – an annual award that is presented each year to the agency’s community partner of the year. Also during the event, longtime Big Brother and BBBS of the Bluegrass board member, Reginald Smith, was presented with the Big Brother of the Year award, and longtime Big Sister, Angie Slack, was presented with the Big Sister of the Year award. The top fundraisers from each of the agency’s Bowl for Kids’ Sake were also recognized during the event. Winners included Team Pinheads and Team Gutter Busters with Gray Construction in Fayette County; Team Legal Eagles and Baptist Health ICU in Madison County; Corning and Whitaker Bank in Boyle County; and KDMK and Traditional Bank in Montgomery County. Valvoline was also recognized for being the top contributing Bowl for Kids’ Sake organization, having raised $30,000 in 2018. Currently, BBBS of the Bluegrass’ two biggest volunteer needs are for School-Plus volunteers (mentors who can visit one of three partner schools each week for about an hour) and male volunteers, particularly men of color. “Brothers Reaching Back” is the agency’s most recent initiative aimed at attracting more men of color to become mentors. With more than 200 children on the waiting list, more than 70 percent of whom are boys, BBBS of the Bluegrass is in need of more volunteers to support young people. Since 1957, Big Brothers Big Sisters of the Bluegrass has provided professionally-supported mentoring relationships to countless children and their adult mentors. For more than 60 years, Big Brothers Big Sisters of the Bluegrass has operated under the belief that inherent in every child is the ability to succeed and thrive in life. We make meaningful, monitored matches between adult volunteers (“Bigs”) and children (“Littles”), ages 6 through 13, in communities across Central Kentucky. We then help develop positive relationships that have a direct and lasting effect on the lives of our young people. For more information, visit www.bbbs-bluegrass.org. Big Brothers Big Sisters provides children facing adversity with strong, enduring, professionally supported one-to-one mentoring relationships that change their lives for the better, forever. Big Brothers Big Sisters ensures that the children in its program achieve measurable outcomes, including educational success, avoidance of risky behaviors, higher aspirations, greater confidence, and better relationships. This mission has been the cornerstone of the organization’s 114-year history. With nearly 300 Affiliates across the country, Big Brothers Big Sisters has served more than 2 million children (“Littles”) in the past 10 years. Learn more at www.bigbrothersbigsisters.org.